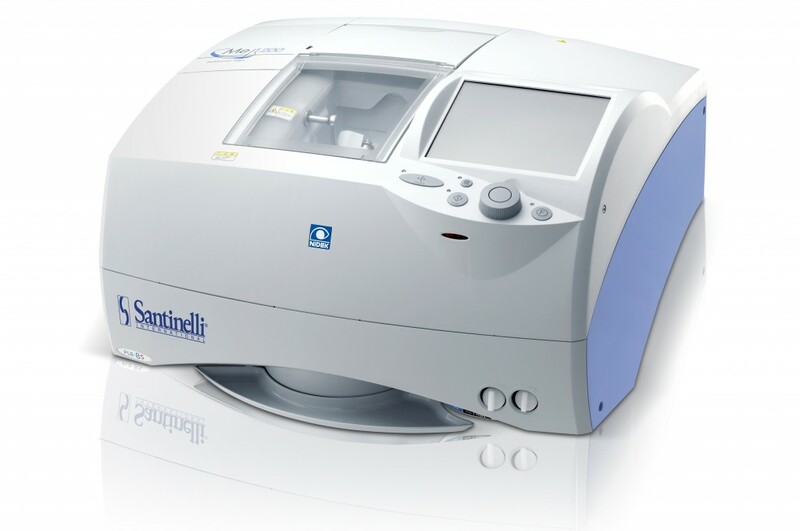 Enabling Finishing Labs to make the impossible - possible, Santinelli International's Flagship Me 1200 Lens Edger, the most compact, feature-rich lens edger ever introduced. Wholesale Labs and retail ECP’s alike looking for differentiation and increased profits can now deliver even the most complex and sophisticated eyewear to the highest level of quality standards with ease. The Me 1200 boasts "first-to-market" step-beveling technology, allowing the highest quality Rx lenses for many high-wrap frames. Additionally, the Me 1200 delivers high-curve beveling, exclusive partial beveling, partial grooving, Design Cut, faceting, Advanced Shape Editing, 3D grooving and 3D drilling. With its industrial-grade design, the unit is manufactured for highest precision and “whisper-quiet” drilling and notching. It processes every type of 3-piece mount, as well as Chemistrie™ Sunlenses with the unit’s exclusive Click Mode™ software. Click ‘Videos’ on the right sidebar to see the Click Mode™ software in action! The renowned polishing feature creates a beautiful luster finish on the lens edge and the unit's diamond grooving wheel delivers a clean groove. Another industry first, the Radius Measurement Unit (RMU) measures the radius of the lens for proper cut-out and calculates "volume" of lens material to be removed. Then it automatically sets the Advanced Soft Grind Mode in motion based on lens material selected. All of this achieves the fastest grinding process all while retaining axis on even the most slippery super A/R coatings. Exclusive, BMW-style "Jog-Dial" operations represent an industry first and provide ease-of-use and precision operation, as does the new graphic design color display.The company’s new, proprietary Self Adjusting System (SAS) “Wizard” technology provides quick self-calibration and auto-adjustment. Power Consumption: 1.5 kVA max. We have been using Santinelli since 1993. I would not consider using any other edger!